She says that she has lost her hope in humanity and she says it in such a sad and horrific way that reminds one of the bewildered eyes of a child facing rubbles and bomb and shrapnel and blood. 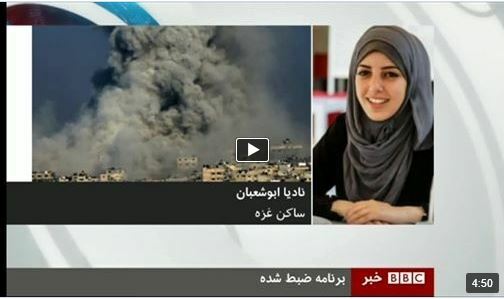 The BBC host is trained to censor Israel’s crimes with tricks and fraud in the question designs; but apparently continuing the interview with Nadia’s final sentences was not in favor of Britain’s neutral and truthful media!!! Nadia AbuShaban: I say to the world that Israel is an occupying force and this is our land. Last night BBC was showing that Hamas was hitting its rackets to our own houses by mistake! Do you get your news from Israel Defense Forces?!!! By the way, what news do you have of Kobani dear BBBBC?!! !